Creating sweet treats that aren’t too heavy can be a challenge. Desserts that focus on fresh fruit are a good way to indulge without going overboard. 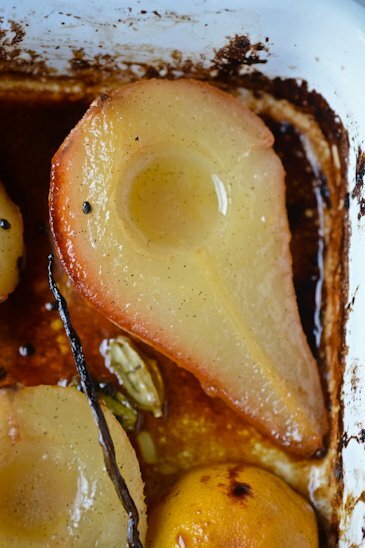 Roasting the pears really transform them, bringing out and caramelizing their natural sugars. The cashew cream is the perfect replacement for traditional whipped cream, rich and creamy with just a touch of heat from the cardamom. Using a whole vanilla bean really infuses the cream with the most amazing flavor. Make sure you use a fresh vanilla bean, if your bean is dry heat a little water in the microwave and then soak the bean for 30 minutes or so until the bean is plump and soft. 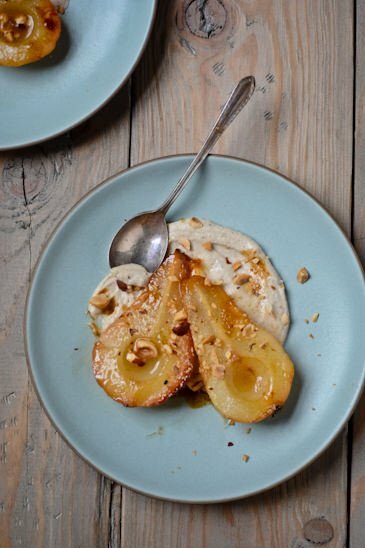 You could also serve the pears with your favorite ice cream or a dollop of greek yogurt. The cashew cream is delicious on it’s own but would also be great with some fresh blackberries or raspberries. Drain and rinse the cashews. If your vanilla bean is not fresh you can soak it in boiling water for 15 minutes to make it more pliable and easier to process. Drain the vanilla bean if soaking, cut it in half and add to the blender along with the cashews, maple syrup, almond milk, cardamom and salt in a blender and process until creamy and smooth. Pre-heat the oven to 375 degrees. Lightly butter the bottom of a baking dish. Mix the maple syrup, lemon juice, and cardamom in a large bowl. Scrape the remaining half of the vanilla bean and add the seeds and bean to the bowl. 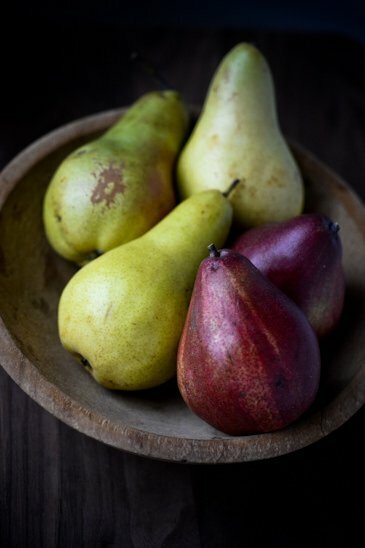 Cut the pears in half, remove the peel and core and gently toss them in the maple syrup mixture. Arrange the pears cut-side down in the baking dish. Pour any remaining maple syrup mixture over the top and pour the water into the bottom of the pan. Cut the remaining butter into small pieces and sprinkle on the top of the pears. Roast the pears for 20 minutes, then gently turn them over and spoon some of the cooking liquid on top. Continue roasting, basting the pears occasionally until the pears are tender and golden, about 20 to 30 minutes. 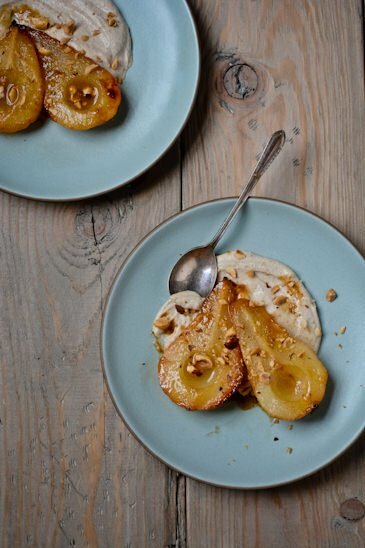 To serve spread a few tablespoons of the cashew cream on a plate, place the roasted pears on top and sprinkle with some chopped hazelnuts if desired. Just had to tell you that I bought the ingredients for this dessert when I did my weekly shopping today and can’t wait to try it! I hope you like it Elissa! I’ve been sneaking into the kitchen and eating the cashew cream with a spoon whenever I want something sweet! I’m so glad you like it Susanne, I’ve also found that if I make the cream without any sweetener it makes a great substitution for any dish that uses heavy cream. It’s amazing in soups or if I add garlic, and herbs it makes the most delicious dip! I would like to make this but I am confused about the vanilla bean. In the list of ingredients it calls for the scrapings from half a bean. In the instructions it says add whole bean. Iv’e never heard of using them whole. I stopped reading after the confussion over the vanilla bean, but went back to see if it would be cleared up if I read the whole thing. It calls for the whole bean to go into blender but in the next step it says put pod and seeds in bowl. I apologize for the confusion. My only excuse is that I was posting a recipe everyday and I obviously rushed the writing of this post. I have rewritten the instructions to make it clear and I hope you enjoy it if you give it a try. I do use the whole vanilla bean. I process half of it into the cashew cream and then scrape the seeds of the remaining half and add the pod to the dish as the pears roast. I love using the entire bean if it is going to be processed in a food processor or blender. I usually keep my vanilla beans in a jar of homemade vanilla extract so they are always pliable and ready to process but you can achieve the same result by soaking the bean for 10-15 minutes in boiling water before you split the pod and use it in the recipe if your bean isn’t the freshest. If you don’t want to add the pod to the cashew cream, feel free to just scrape the seeds from half the bean into the mixture before blending. I love the depth of flavor that the pod adds but it’s not necessary at all for the recipe to work. Hope that clears things up and thanks again for checking out the post! Thinking about this for a dinner party. How would you suggest planning ahead? 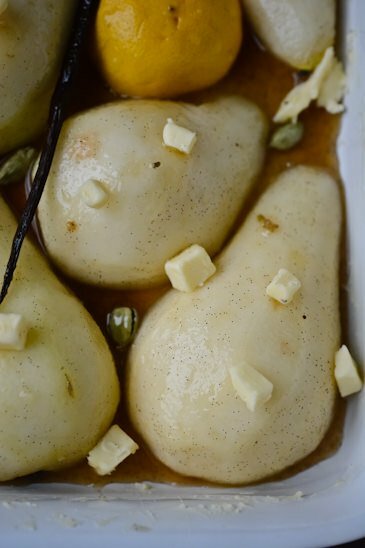 Roast the pears earlier in the day and then warm in oven before serving? Thank you! 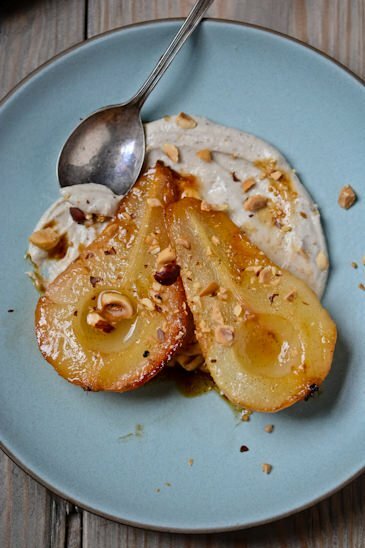 Yes, you can roast the pears earlier in the day. I would take them out of the oven 10 minutes early, while they are still a bit firm. To re-heat them, I’d add a tablespoon or two of water to the pan or a touch more butter so that they don’t dry out. You can make the cashew cream ahead of time; it will keep for about three days and tastes better as it has time to sit and develop. I hope you like them if you give them a try! Do I use the whole cardamom pods in the cream or in the roasting mix? I apologize for the vague instructions. I’ve rewritten the recipe to make it clearer. You want to lightly smash the pods with the back of a knife and then add it to the maple syrup roasting liquid. I Hope that makes sense. Feel free to let me know if you have any other questions. 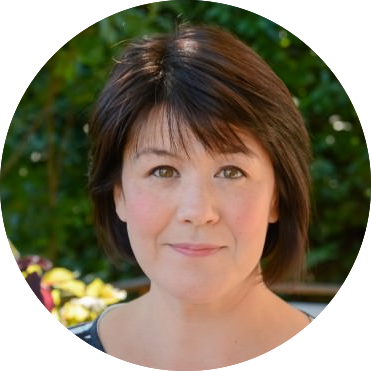 Thank you for checking out the recipe and have a wonderful holiday!